Spring has sprung – or at least we hope it has! Our CFC alumni’s many successes over the past three months indicate that neither snow, sleet nor ice will slow them down. Check out some of the highlights, sprinkled with a few things to look out for in April. A special shout out to all the alumni nominated for Canadian Screen Awards (CSAs) – we’ll be watching and cheering you on March 31 – as well as congratulations to multiple alumni featured earlier this month in the Kingston Canadian Film Festival, in February’s NSI Canada Festival, and as 2019 participants of the Netflix-BANFF Diversity of Voices Initiative. Semi Chellas' 'American Woman,' screening at the Tribeca Film Festival in April. The CFC Features and Vancouver-based film production company Motion 58-produced quirky rom-com feature by alumni Kyle Rideout and Josh Epstein premieres in Japan on April 22 and has a great new poster! Writers’ Lab alumna and recipient of the then-inaugural CFC Award for Creative Excellence, Semi Chellas, is premiering her latest feature at the Tribeca Film Festival, with the first screening on April 28. This documentary, made by Producers’ Lab alumnus Nicholas de Pencier, with Jennifer Baichwal and Edward Burtynsky, has hit festivals from Berlin to Sundance, winning big at the Toronto Film Critics Association Awards and the Vancouver International Film Festival. Looking ahead, on Earth Day (April 22), Crave TV will air it and then in Toronto, the Hot Docs Canadian International Documentary Festival (April 25-May 5) will screen new interactive versions of the film in the festival’s DocX series. CFC Features alumnus and Scythia Films’ Daniel Bekerman (also involved in producing both CFC Features’ 22 CHASER and Giant Little Ones) is producing Falling,the directorial debut from Viggo Mortensen currently in production in Toronto. Read more about this ambitious multi-partner indie in Playback (subscription). Directed by Directors’ Lab alumnus Keith Behrman, this fall festival fave and Canada’s Top Ten Pick scored a win for Best Canadian Screenplay at the Vancouver International Film Festival in January, and will be opening both at TIFF Bell Lightbox in Toronto and then across Canada in Cineplex theatres on March 29. In Toronto on Friday, March 29 at the 7 p.m. screening at TIFF Bell Lightbox, Behrman will hold a Q&A after the film, too! This film, a team effort of multiple CFC alumni, won the William F. White Reel Canadian Indie award at the Canadian Film Festival on March 23. Alumni involved in this film include: CFC Features and Producers’ Lab alumnus Damon D’Oliveira (executive producer); Producers’ Lab alumna Sally Karam (producer); Writers’ Lab alumnae Bonnie Fairweather and Kathleen Hepburn (screenwriters); Editors’ Lab Michael Pierro(editor); and the film stars CBC Actors Conservatory alumnus Steven Love and one of the Program’s current residents, Michelle McLeod. Directors’ Lab alumna Brigitte Berman was interviewed by The Kingstonist for her extensive archival work on this thought-provoking documentary, as part of its screening at the Kingston Canadian Film Festival. Directors’ Lab alumna Danishka Esterhazy has been busy with the March release of her dystopian thriller. The film had its U.K. Premiere in Glasgow on March 1, as part of FrightFest at Glasgow Film Festival (FrightFest is the U.K.'s largest genre event held in London during August). Esterhazy has shared her insights on the making of this film with the National Screen Institute (NSI), She Does the City, The National Post and That Shelf. Its nationwide release is ongoing in some spots; see more information here. CBC Actors Conservatory alumna Grace Glowicki directed this festival hit, which won the SXSW Adam Yauch Hörnblowér Award at South by Southwest Festival (SXSW), a project in which she also plays the lead and collaborated with fellow CFC alumnus from the Slaight Music Residency, composer Casey MQ. Learn more of Glowicki’s approach in this interview in Filmmaker Magazine. Co-director and Producers’ Lab alumnus Sebastián Barriuso with his brother and co-director Rodrigo screened their film at TIFF Bell Lightbox this March, and held a Q&A with programmer-turned-senior director of film, Diana Sanchez. 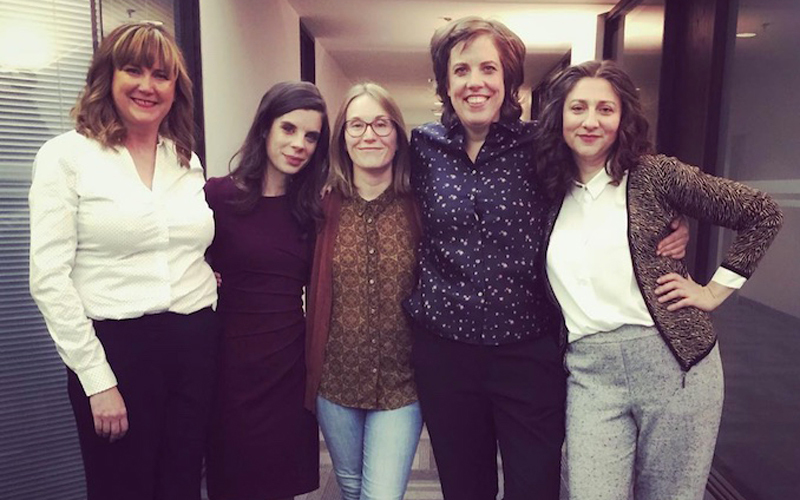 As this series embarks on its third season of production, it does so with a Gay and Lesbian Alliance Against Defamation (GLAAD) nomination, for Outstanding Kids & Family Programming – congrats, Producers’ Lab alumna and executive producer, Miranda de Pencier! 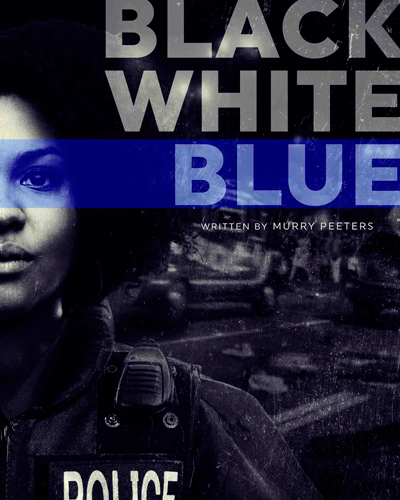 This groundbreaking new series with Canadian primetime TV's first black female lawyer (Vinessa Antoine) features the skillful directorial eye of Directors’ Lab alumnus Cory Bowles, as well as executive producer Amos Adetuyi, alumnus of the Tribeca All Access Program. Writers’ Lab alumnus Joel Thomas Hynes, who created and stars as the lead of the CBC Series Little Dog, and Bell Media Showrunner Bootcamp alumna Sherry White, series showrunner, shared a fascinating conversation on the series in Brief Take, on the occasion of its second season premiere this past January. 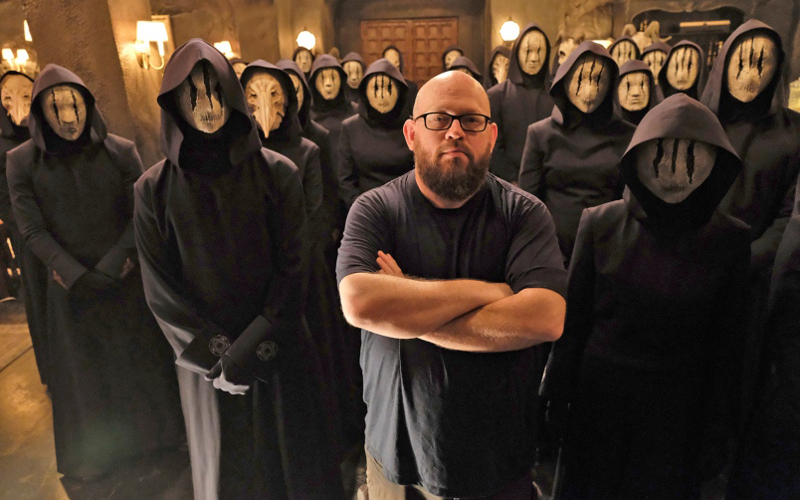 This scary-good binge-able Netflix series dropped in March, and was created by Bell Media Showrunner Bootcamp alumnus-turned-2017 Executive Producer in Residence of the 2017 Bell Media Prime Time TV Program, Dennis Heaton. He chatted with TV Junkies about his new series. As Deadline notes, CTV has partnered with NBCUniversal International Studios on primetime medical procedural, to be executive produced by Bell Media Prime Time TV Program alumna Virginia Rankin. The series was created by Joseph Kay, an alumnus of the Bell Media Showrunner Bootcamp. We’re thrilled to see homegrown DJ and Directors’ Lab alumna hey! DW, playing a pivotal role onscreen and behind the scenes in this new Netflix series, starring Idris Elba and Piper Perabo. Learn more about their approach to DJ-ing, so pivotal to the series’ content, here. Jordan Canning, centre, with the four stars of the 'Baronness von Sketch Show.' Photo Credit: Toronto Guardian. TV Junkies profiled Directors’ Lab alumna Jordan Canning, who’s been busy directing multiple TV series as of late, including international hit The Baronness von Sketch Show. CBC Actors Conservatory alumna Devery Jacobs has been busy in the past month, profiled in several publications, including this one and a great piece in Xtra, all in the leadup to her appearing on this season of American Gods. As Playback (subscription) notes, two Canadian production companies are starting a new six-film anthology series based on the Globe and Mail‘s “First Person” essay series, and Directors’ Lab alumna Renuka Jeyapalan is one of three directors signed on to the project. Editors Lab alumna Jane MacRae shares some of her tips on what to do in the editing suite in this Canadian Cinema Editors interview. Writers’ Lab alumna and writer-director Molly McGlynn won the $10,000 Stella Artois Jay Scott Prize for an emerging artist at January’s Toronto Film Critics Association Awards. Indiewire profiled the fast-rising directorial star, Stella Meghie, an alumna of the Tribeca All Access Program, who’s directing Issa Rae in the Paul Feig-produced upcoming feature, American Princess. With his company’s growth in scripted production and a desire to target new opportunities for development and production, Producers’ Lab alumnus Mark Montefiore has opened a new Los Angeles office of his company, New Metric Media, as Playback (subscription) reports. Writers’ Lab alumna Murry Peeters was the runner-up in the 2019 Canadian Film Fest Script Contest, in which the Canadian Film fest partners with the Harold Greenberg Fund on a contest open to Canadian screenwriters who have written a feature-length screenplay and are looking for financial development support. Peters won for her script, Black White Blue, which she developed, in part, during her time in the Cineplex Film Program. In addition to showrunning CBC’s Little Dog, Sherry White is also producing the Telefilm Canada’s Talent to Watch program feature film, Little Orphans, as Playback (subscription) notes.